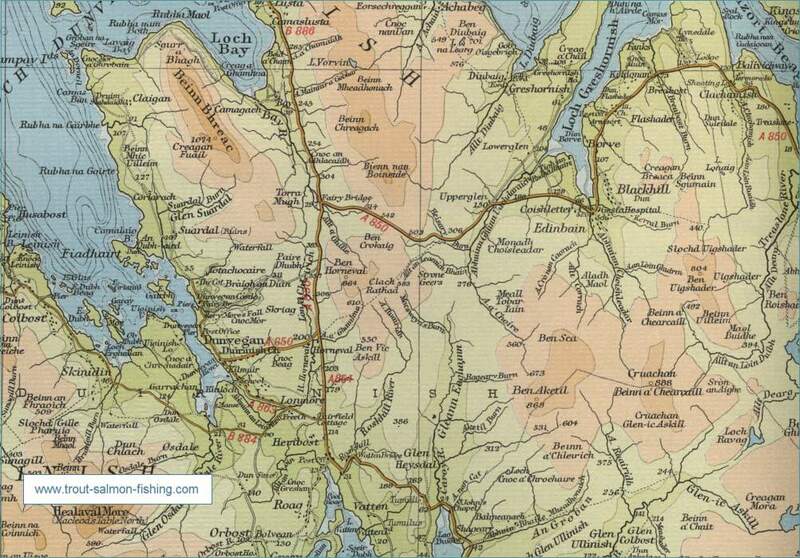 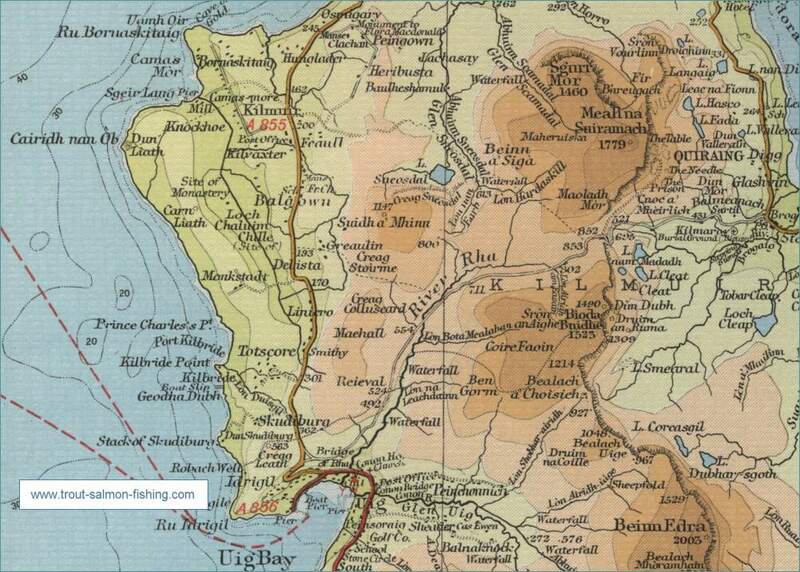 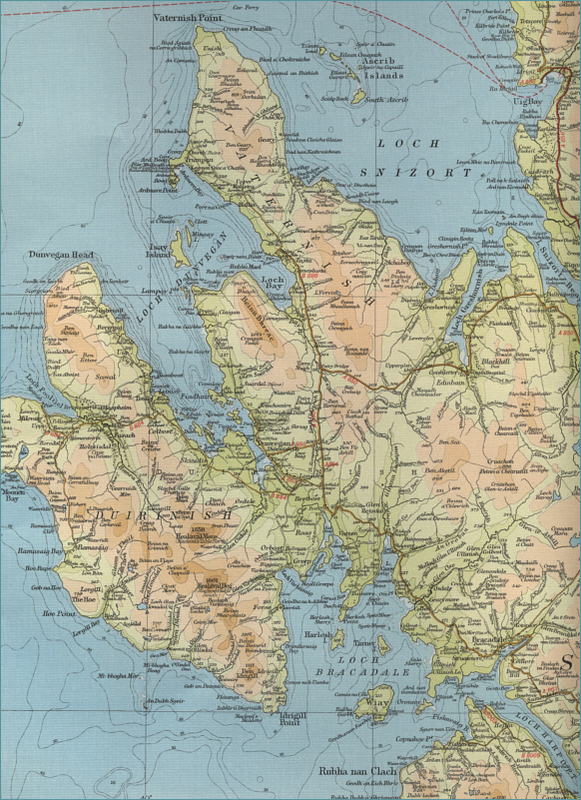 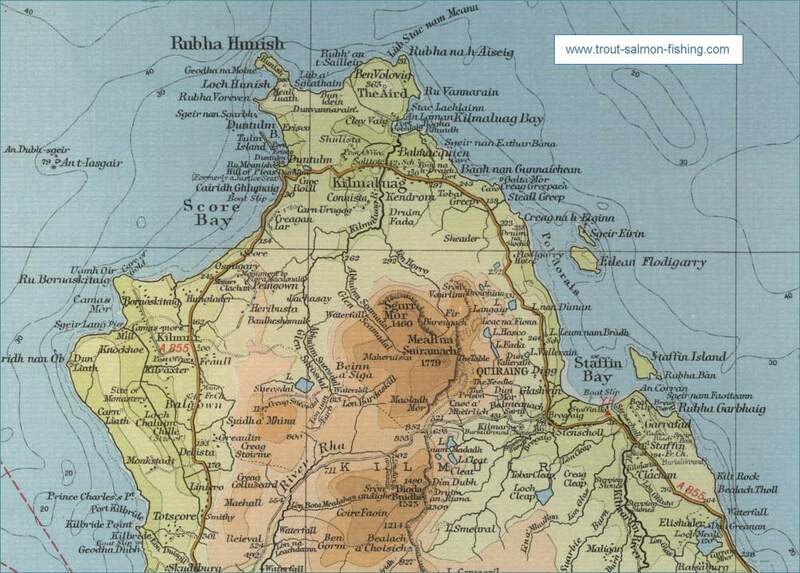 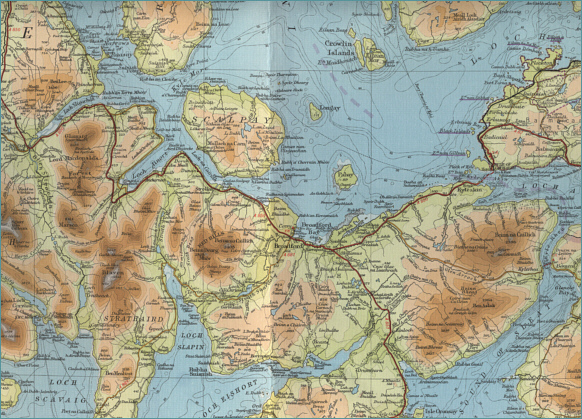 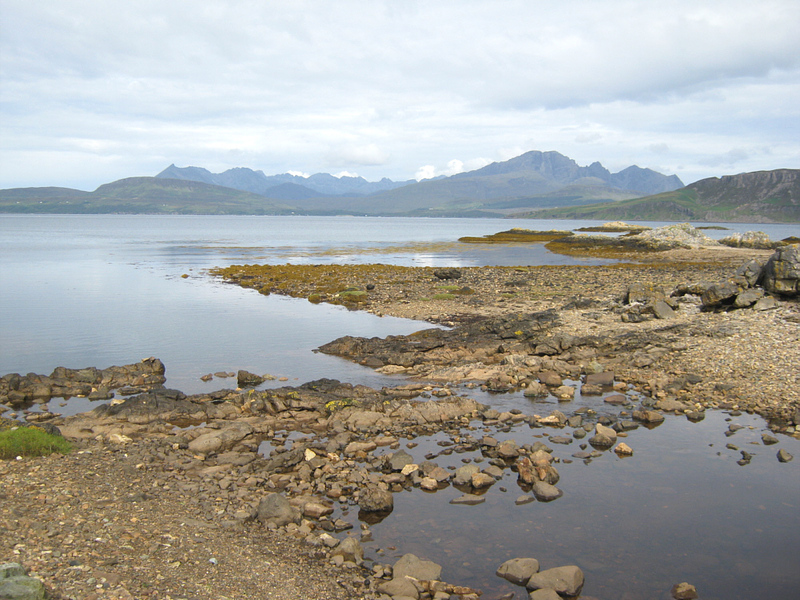 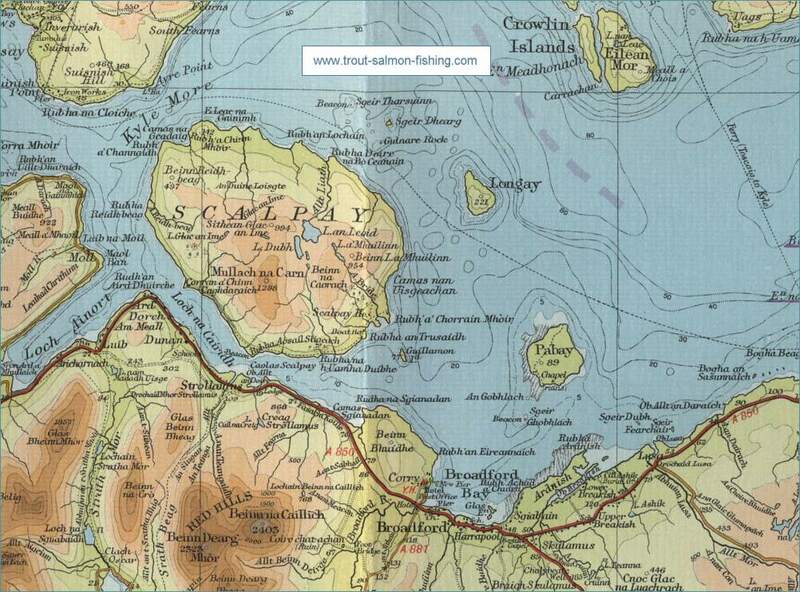 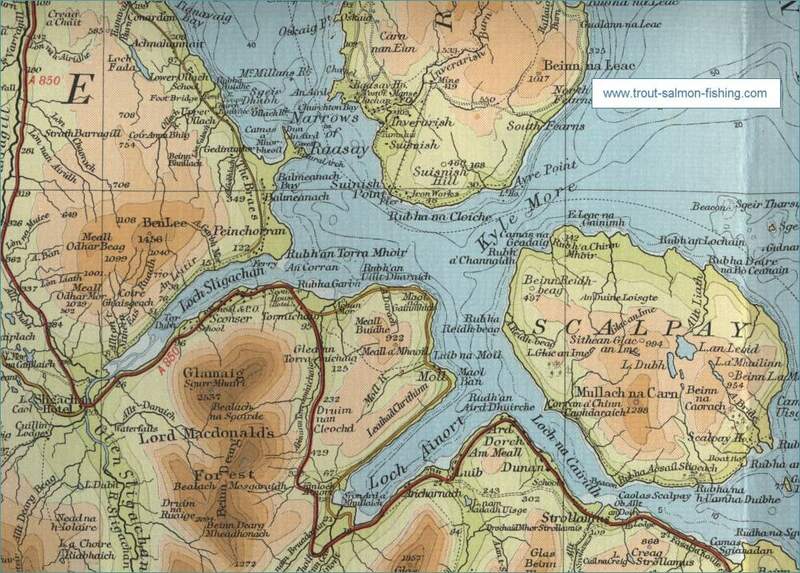 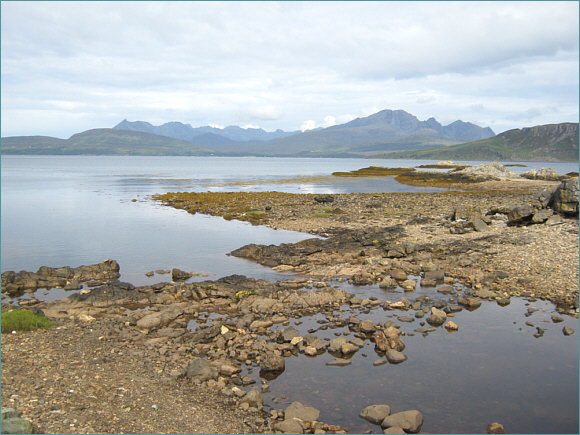 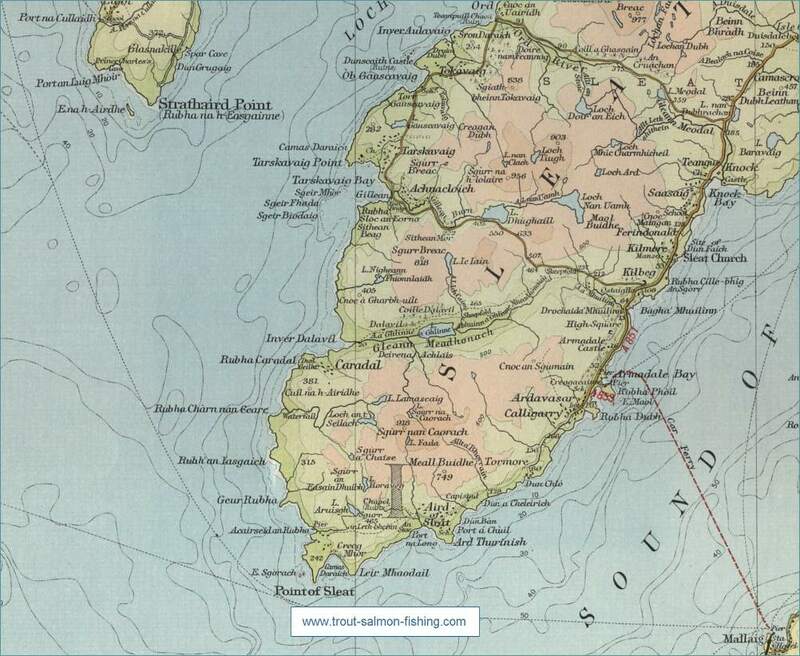 In addition to the varied trout fishing opportunities on the many rivers and lochs throughout its fifty mile length, Skye offers the chance of river fishing for sea trout and salmon on several small spate rivers, some of it, on the beats controlled by the Portree Angling Association, available to visiting anglers from as little £10 per day. 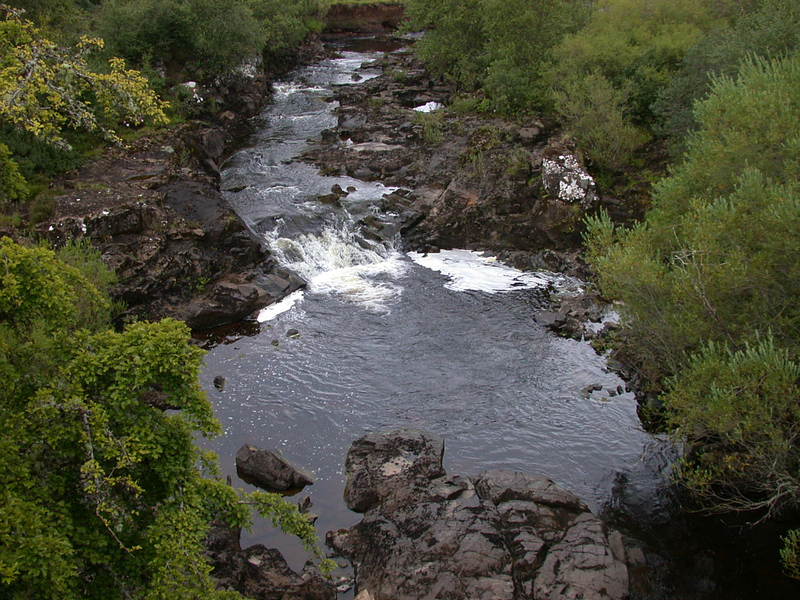 The Lealt is a spate river with salmon and sea trout running as far as the waterfall. 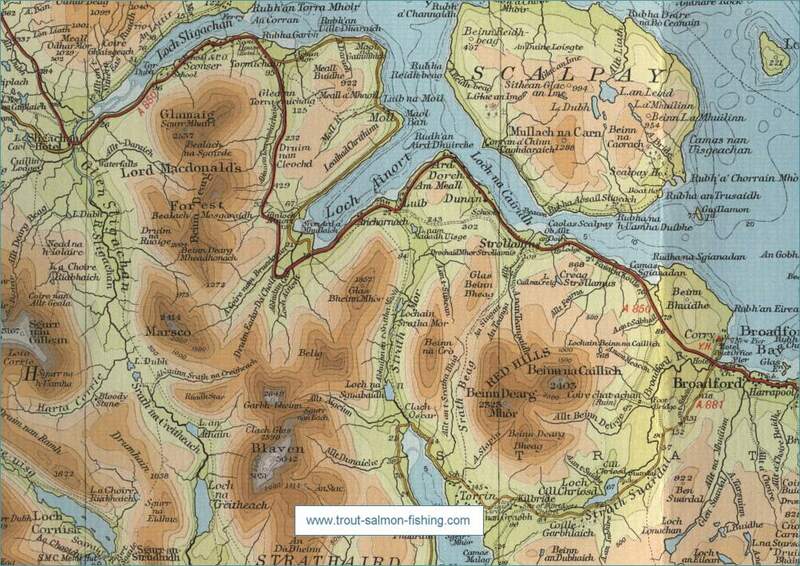 The permit is £10 for half a day with a five fish limit. 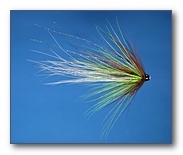 Fly fishing and spinning are permitted. 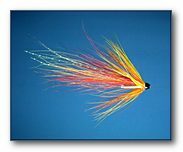 Season: 15th March to 15th October. 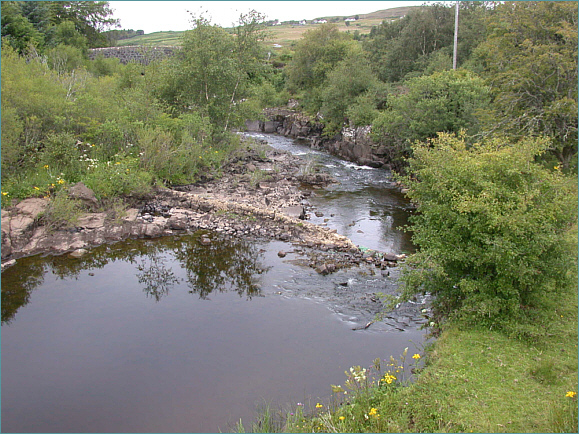 The Lealt has, in recent years, been the most productive of the association's rivers, although it only has one fishable pool, below the Lealt Gorge waterfall. 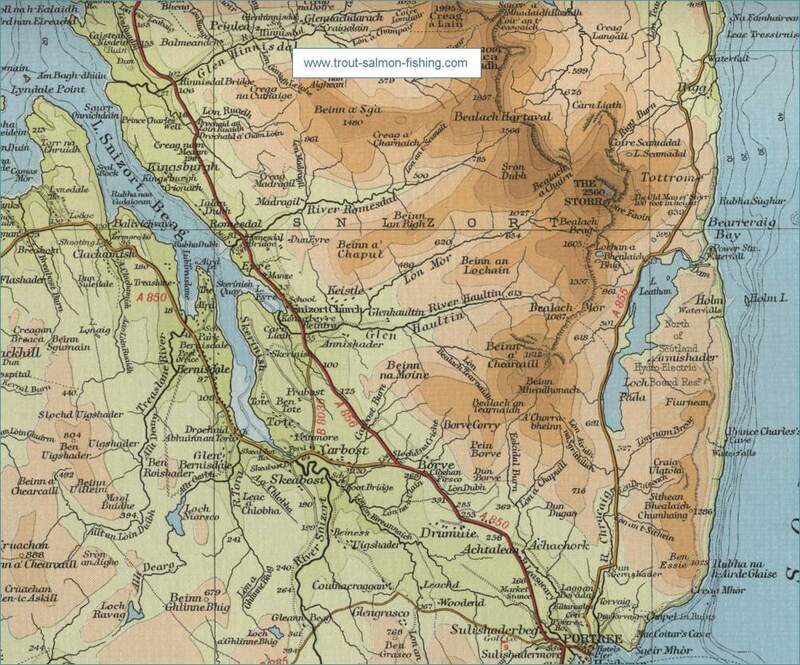 Fishing for salmon, sea trout and brown trout, the lower reaches being best. 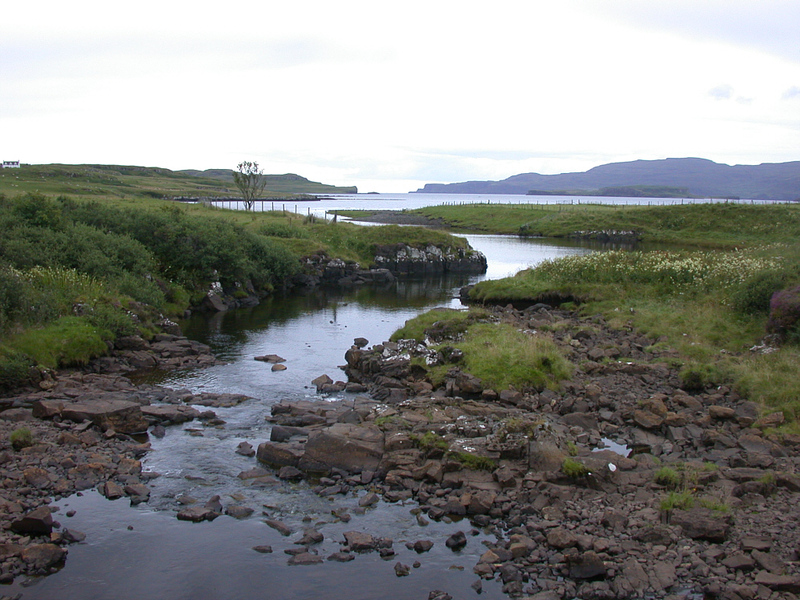 A small river with runs of sea trout and occasional salmon, entering the sea at Kilmaluag Bay in the north of the island - fly, spin or worm allowed. 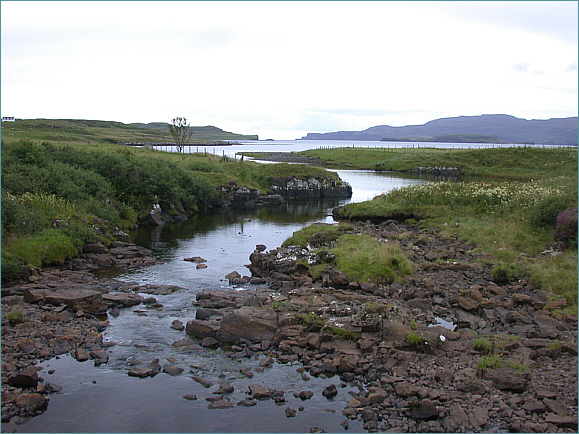 A small spate river with runs of salmon and sea trout, running into Staffin Bay. 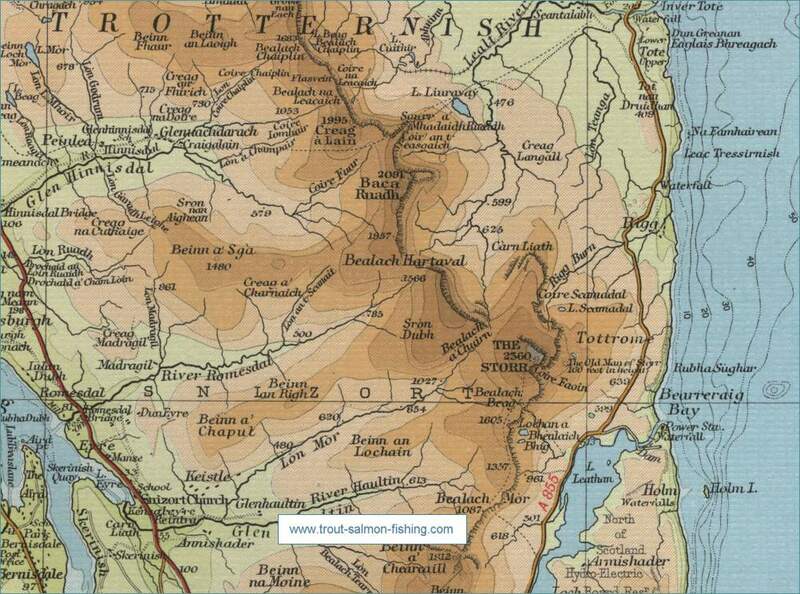 Good brown trout in the upper reaches. 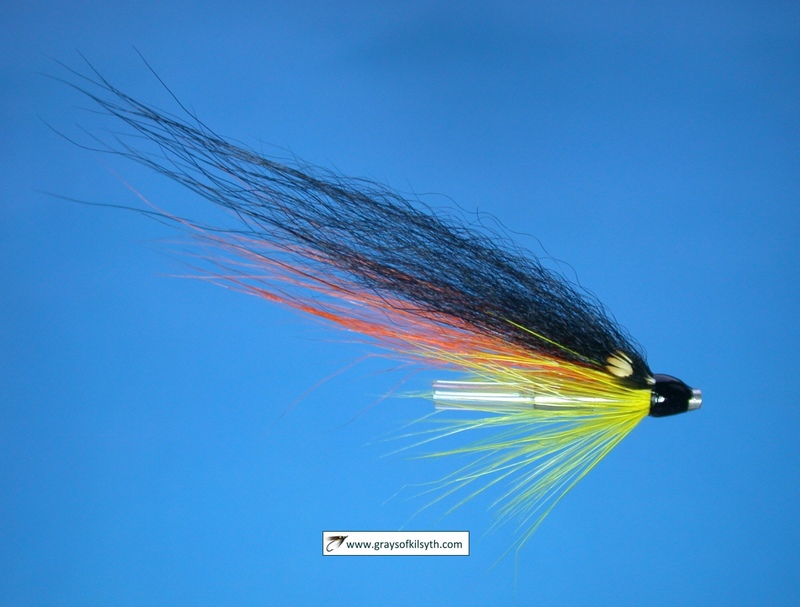 Fly only. 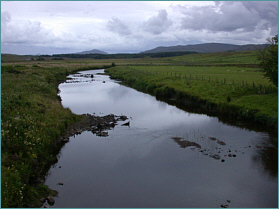 Good pools at the river mouth, where salmon and sea trout can be taken on a spate. 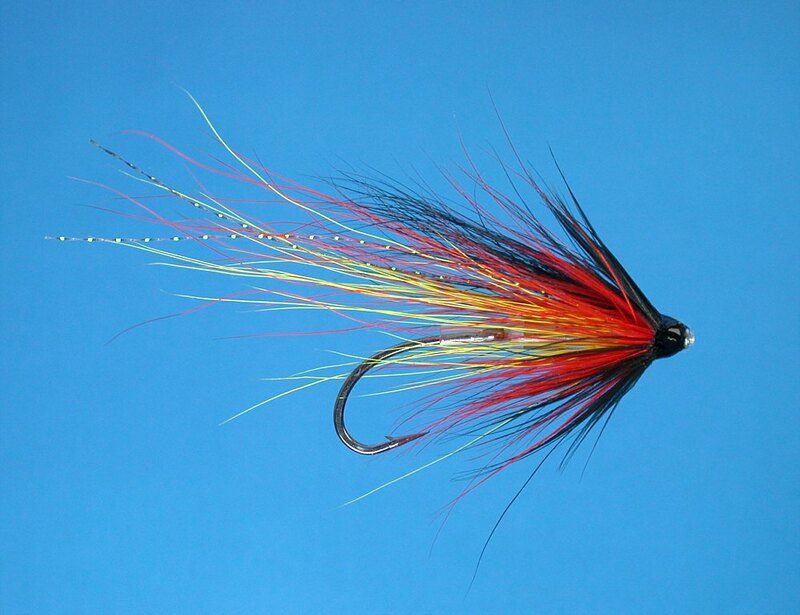 Fly only. 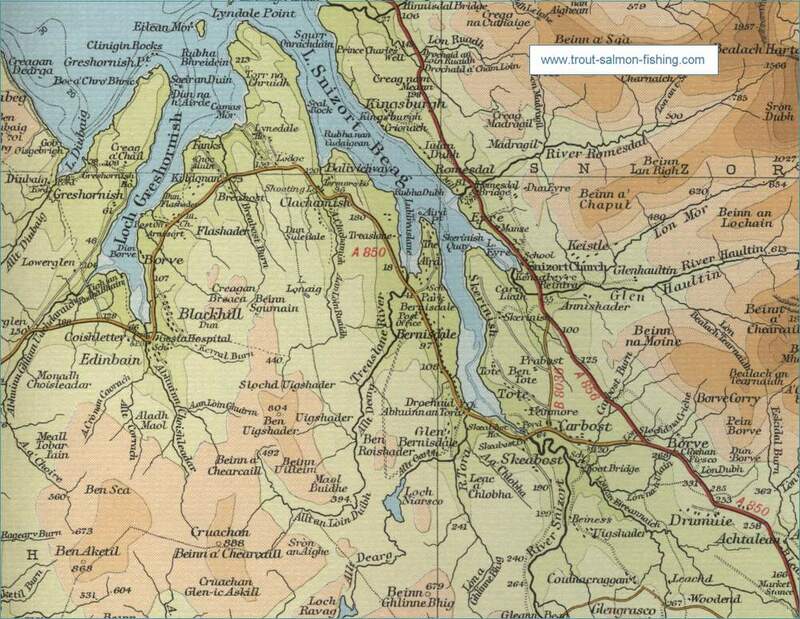 Permits from Gordon Mackenzie, Uig Filling Station - Lochs £8 a day, rivers £12 a day. 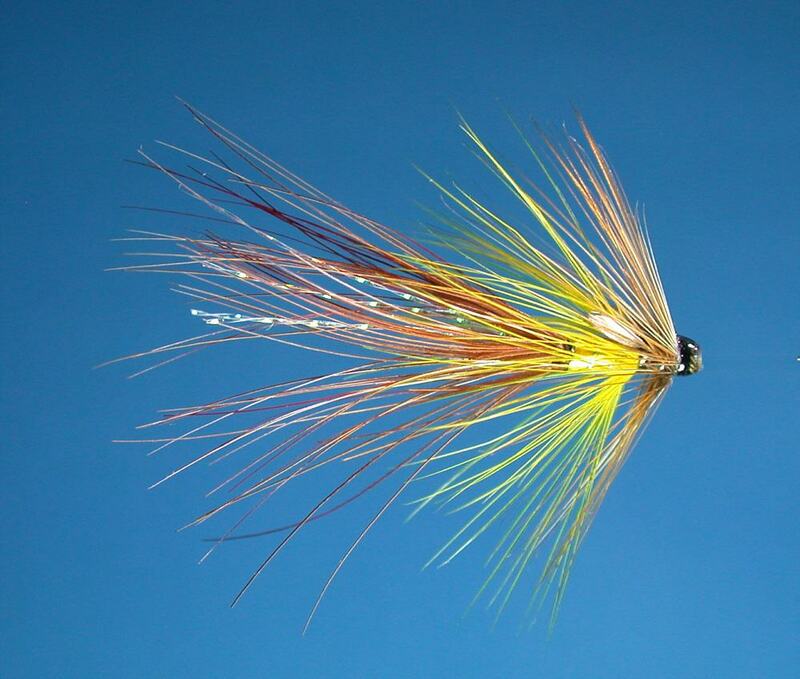 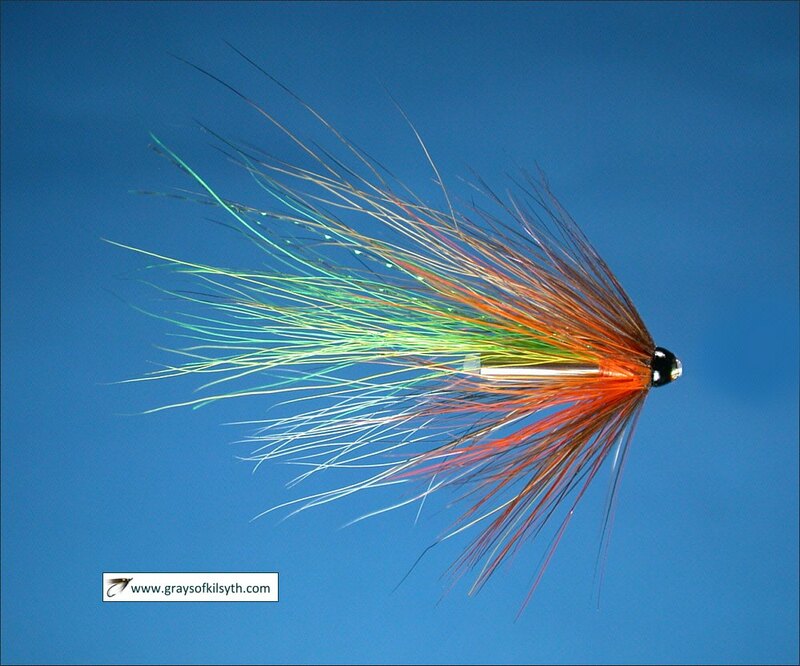 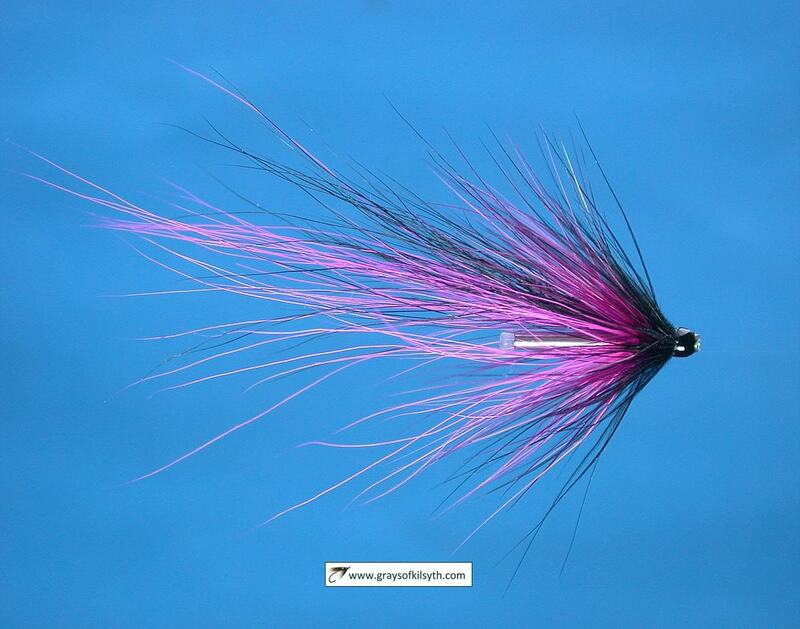 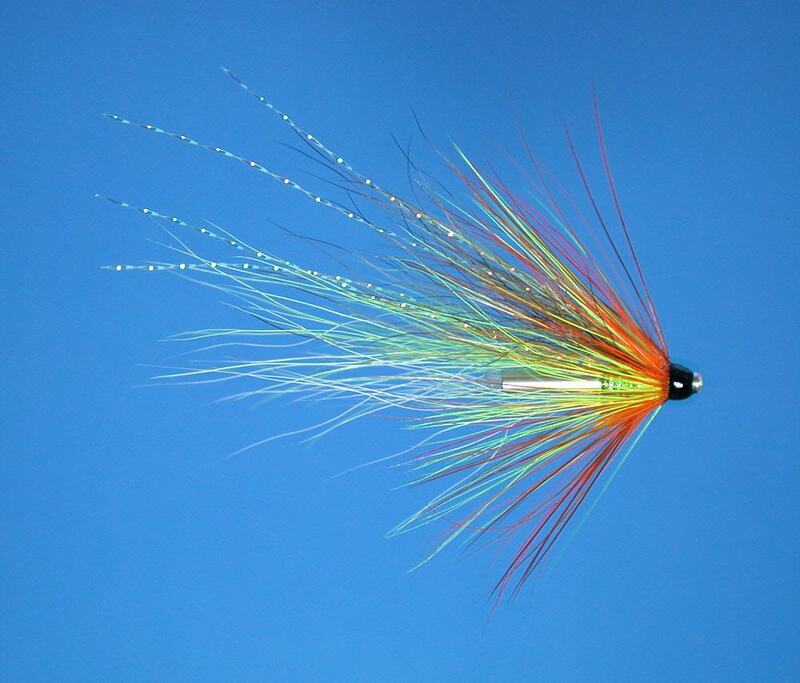 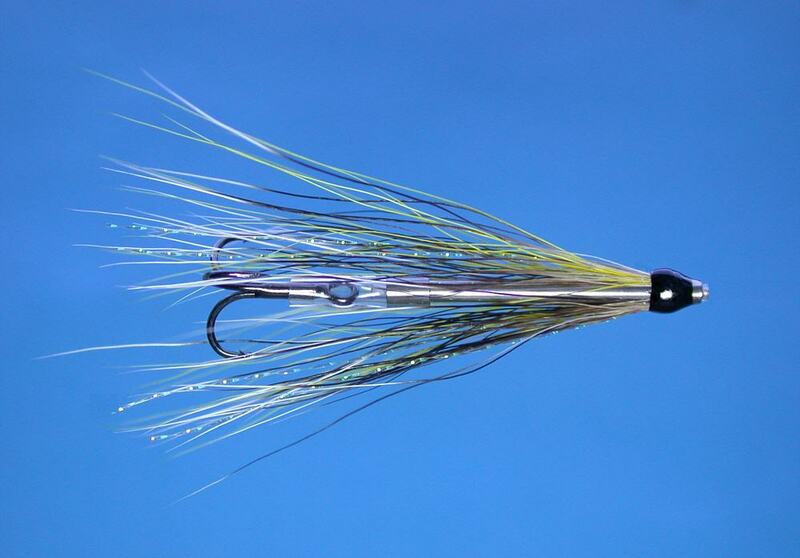 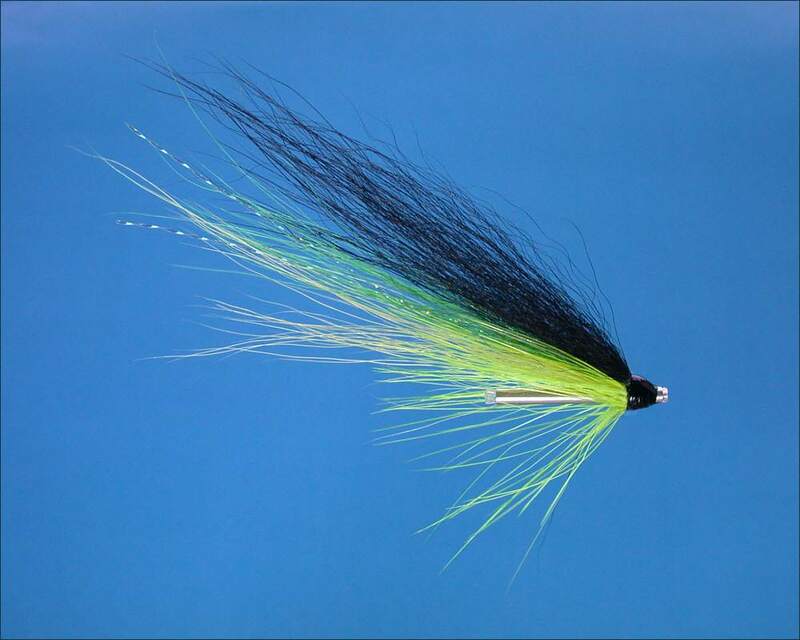 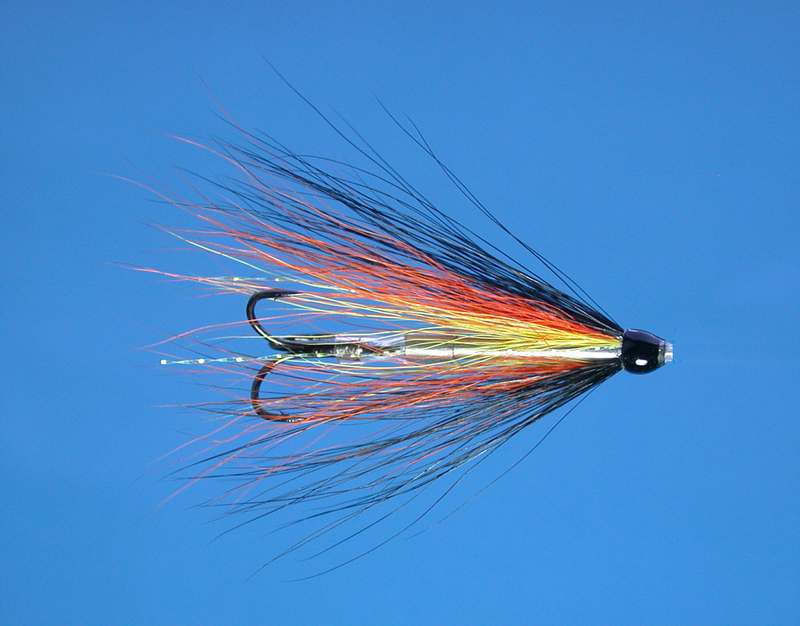 Fly only for Brown trout, salmon and sea trout. 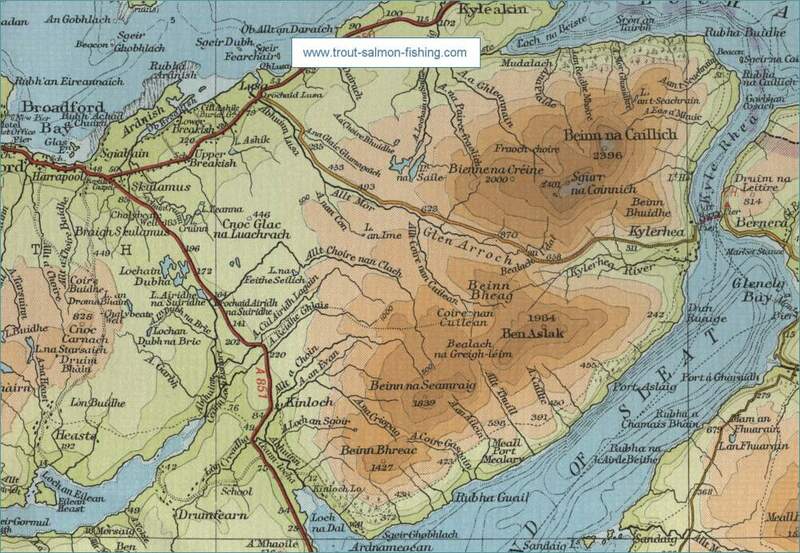 Good brown trout fishing, with some salmon and sea trout. 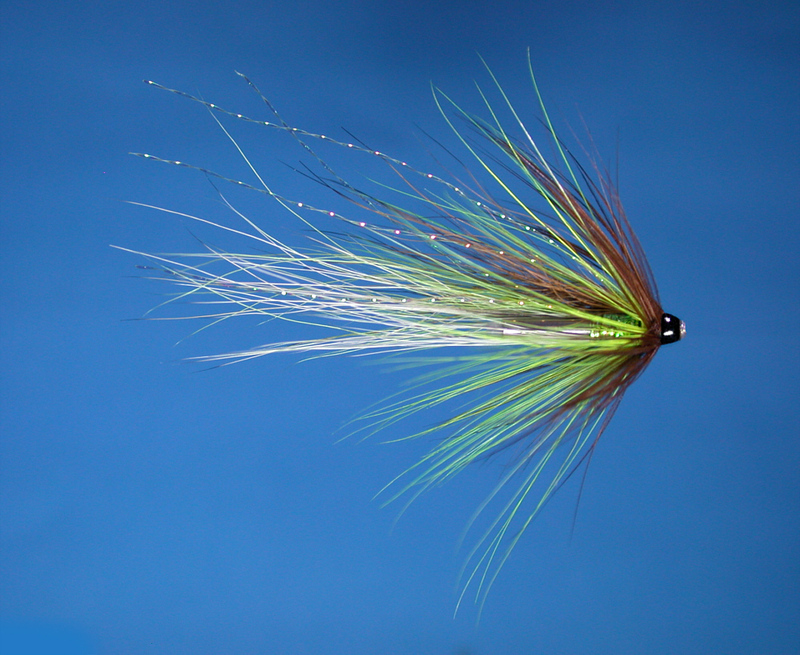 Fly preferred. 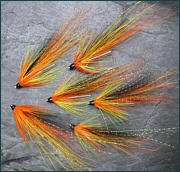 A good spate river for salmon and sea trout - fly only. Spate river best after rain and below the A87. 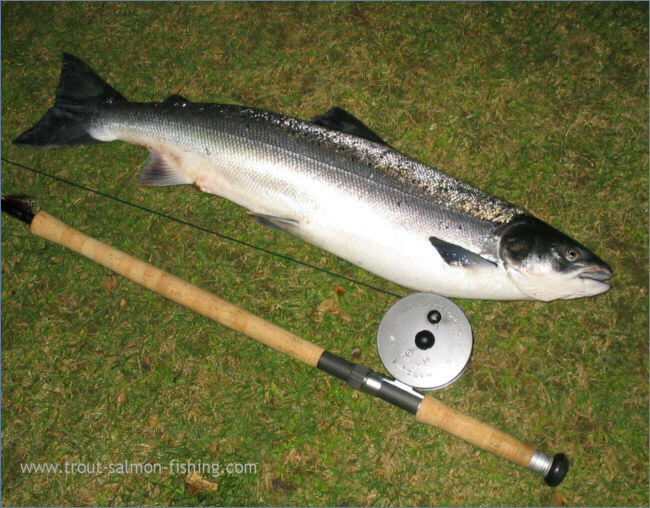 Salmon, sea trout and brown trout. 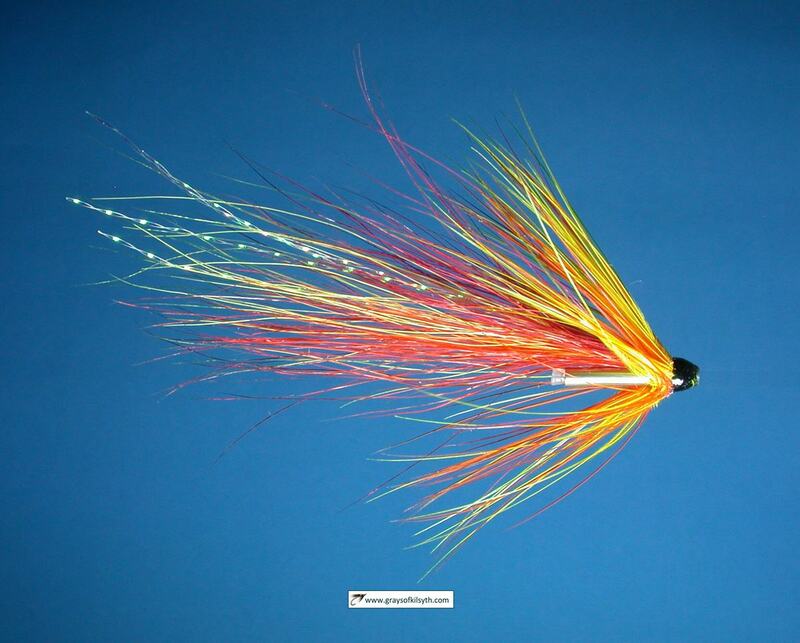 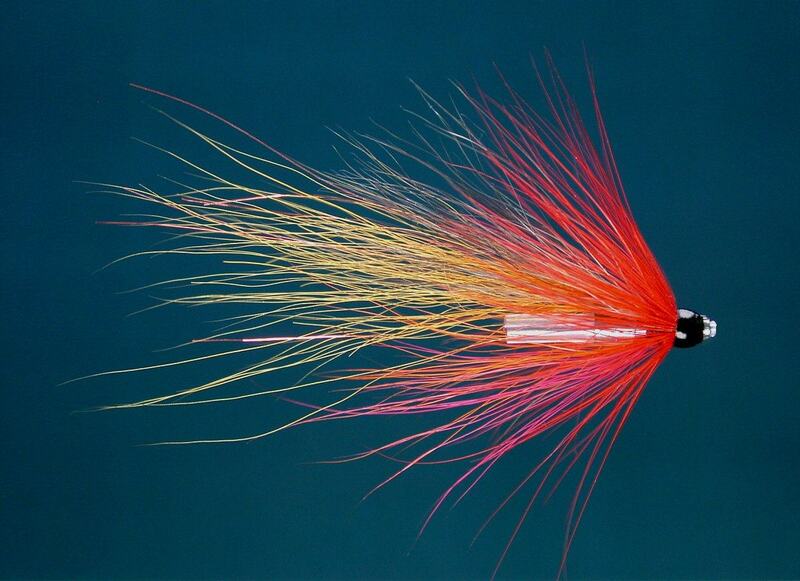 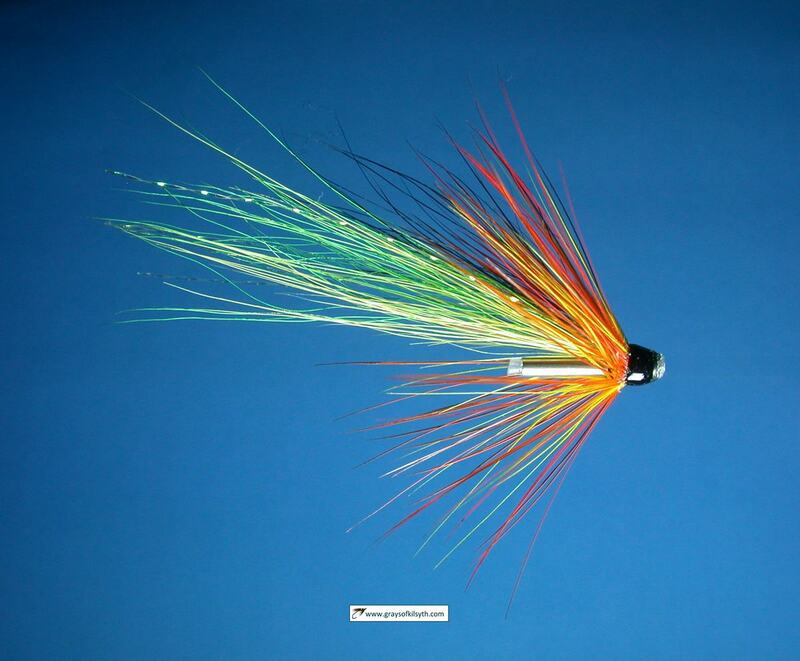 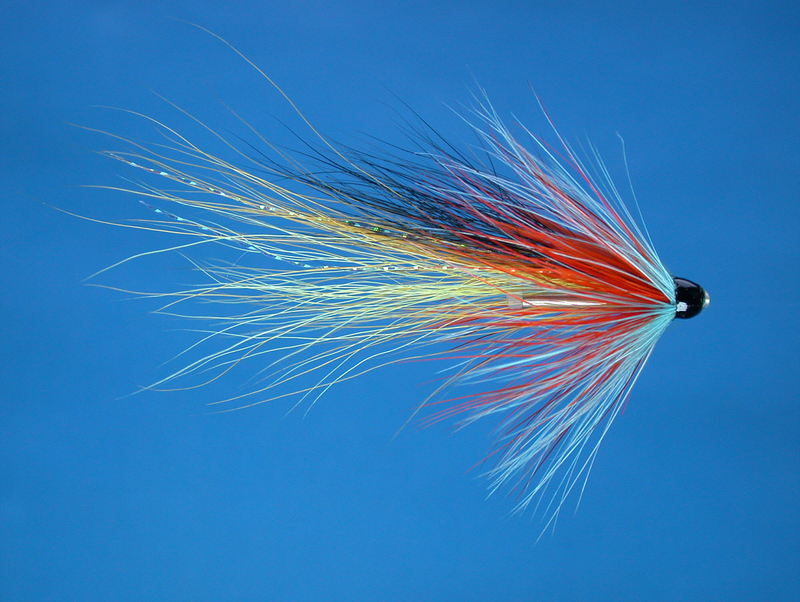 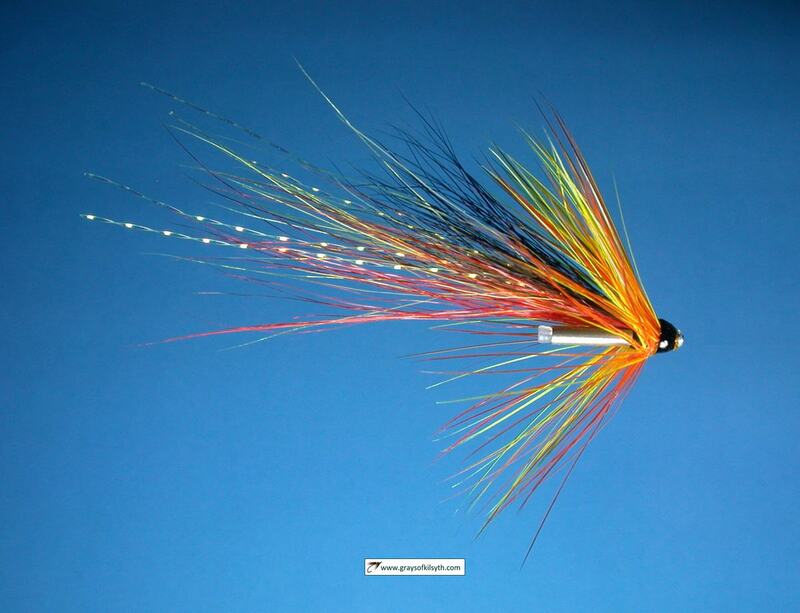 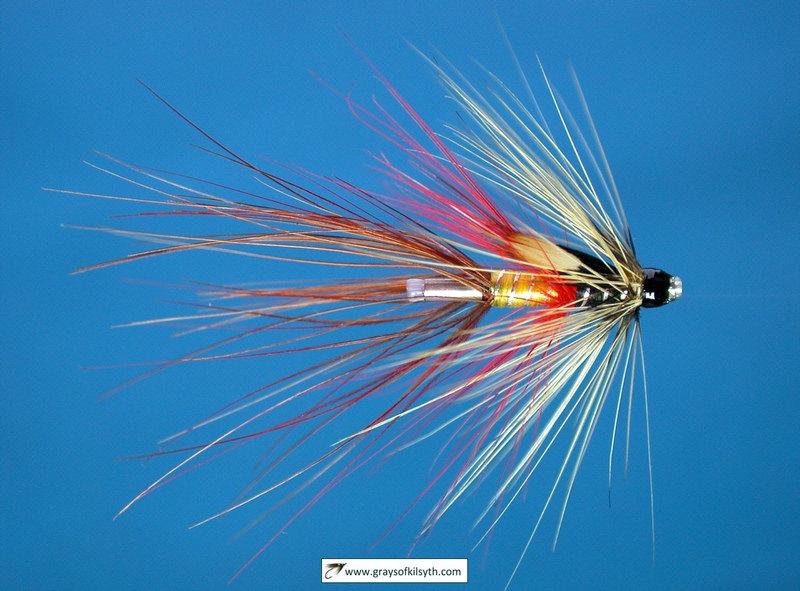 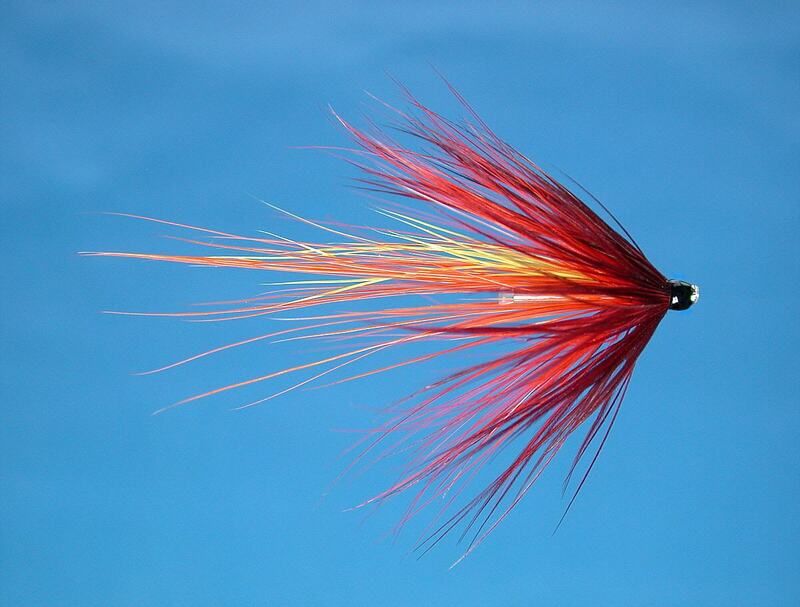 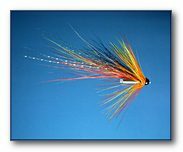 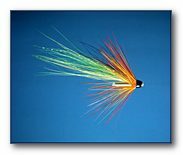 Fly only with catch and release for wild salmon and sea trout. 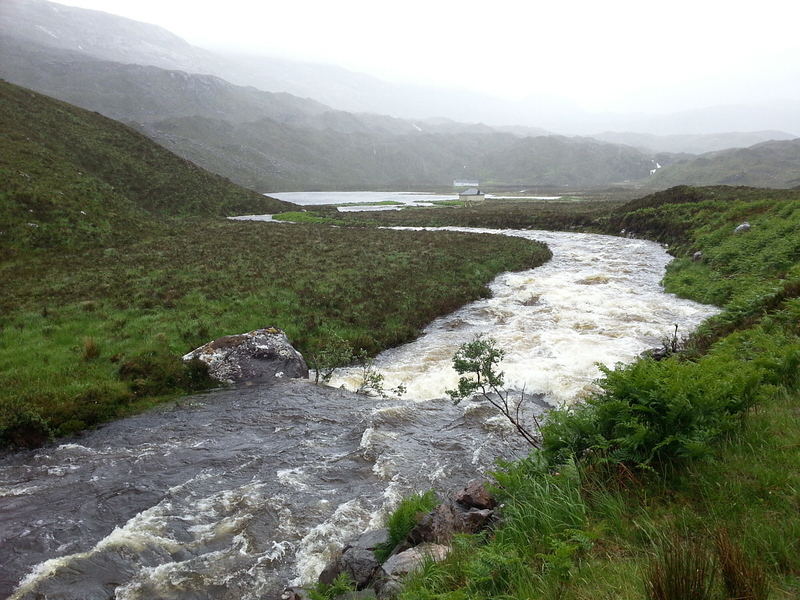 Spate river at its best after rain. 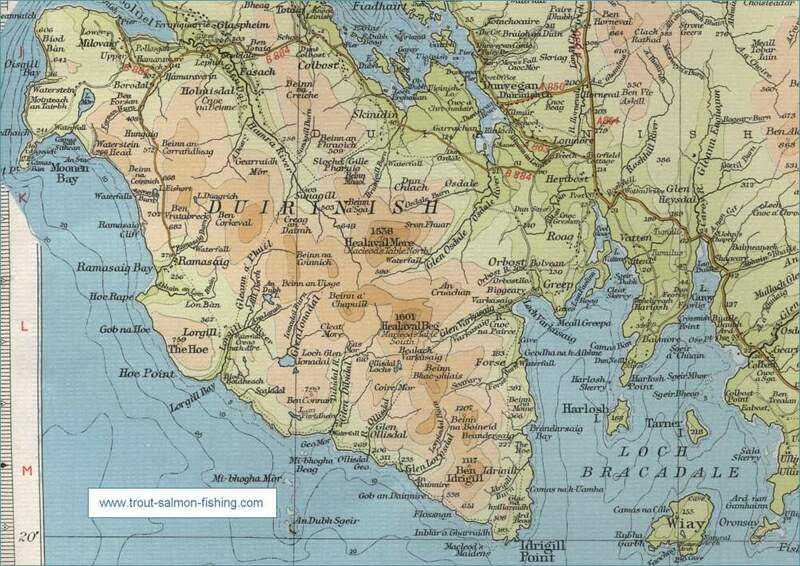 Sea trout best at estuary, depending on tides. 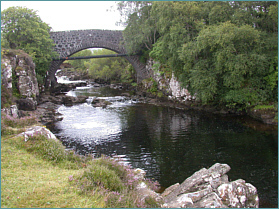 Good salmon pools above the road. 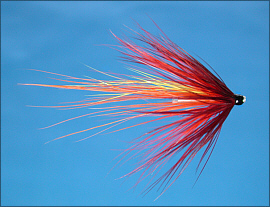 Fly only with catch and release for wild salmon. Spate river with salmon, sea trout and brown trout. 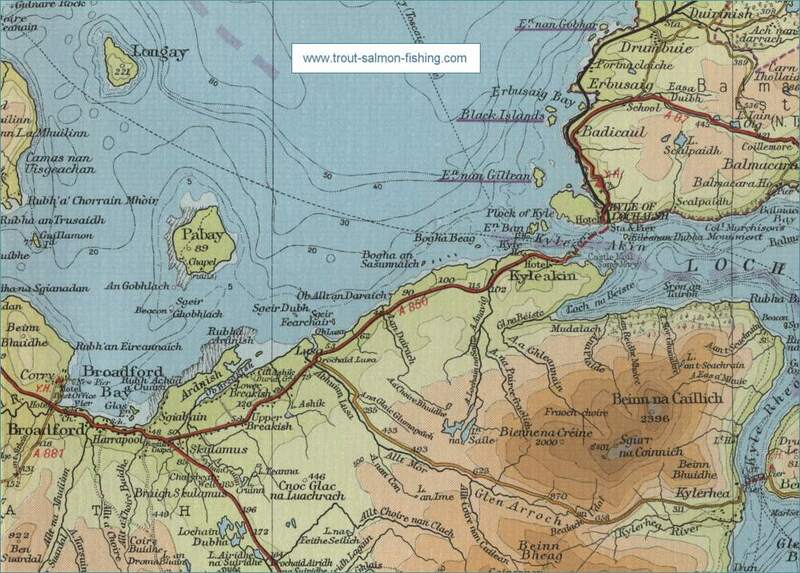 Sea trout best in estuary but tide dependent. 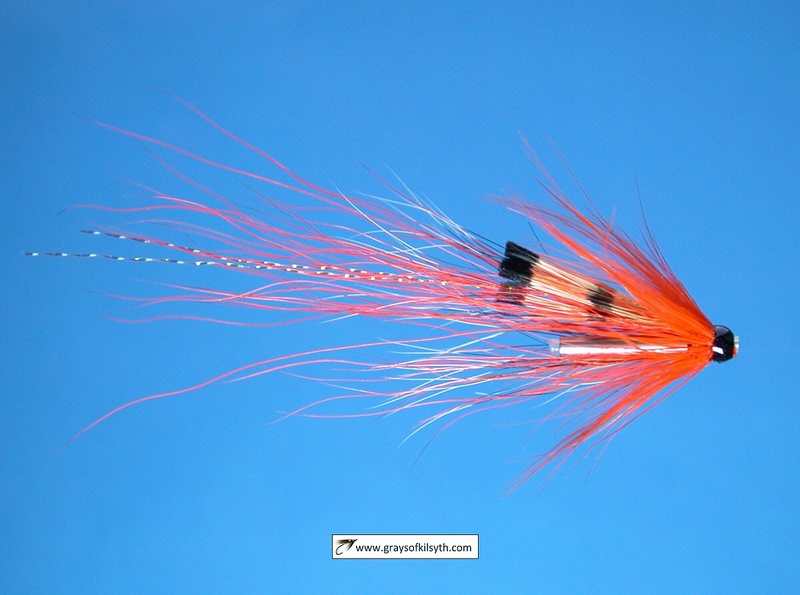 Fly only with catch and release for wild salmon. 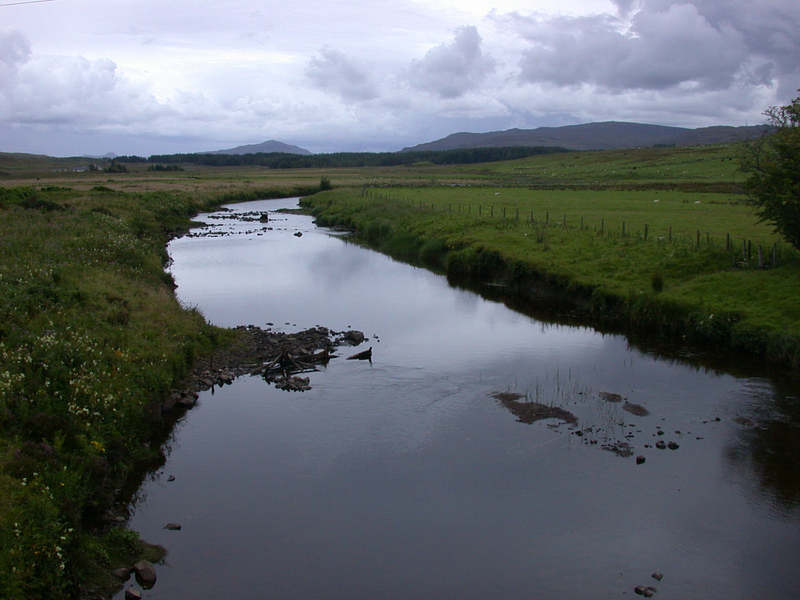 The River Snizort is the most productive of the Skye rivers. 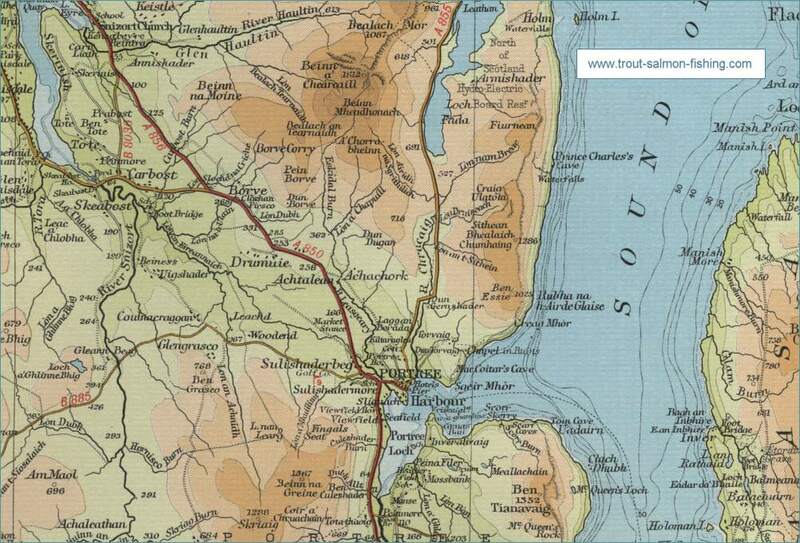 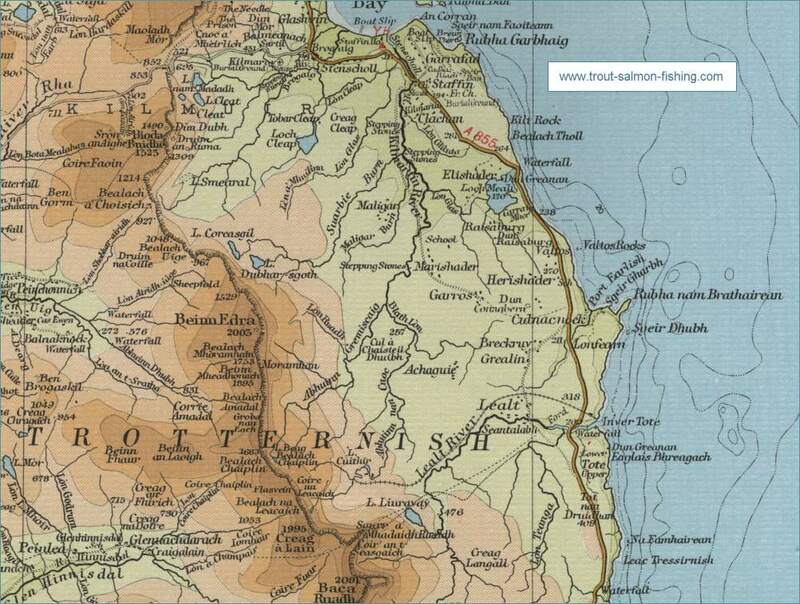 Three Esses Ltd operates the fishing on the greater part - some eight miles of the lower river. 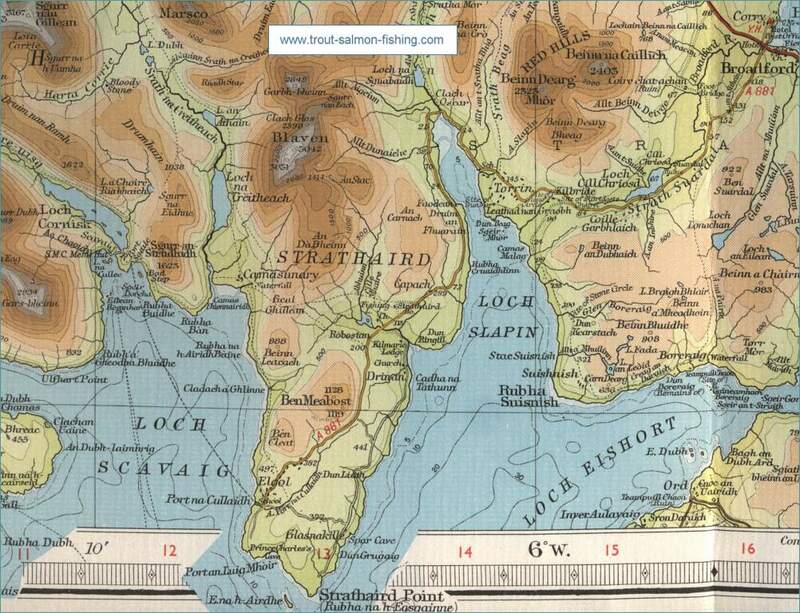 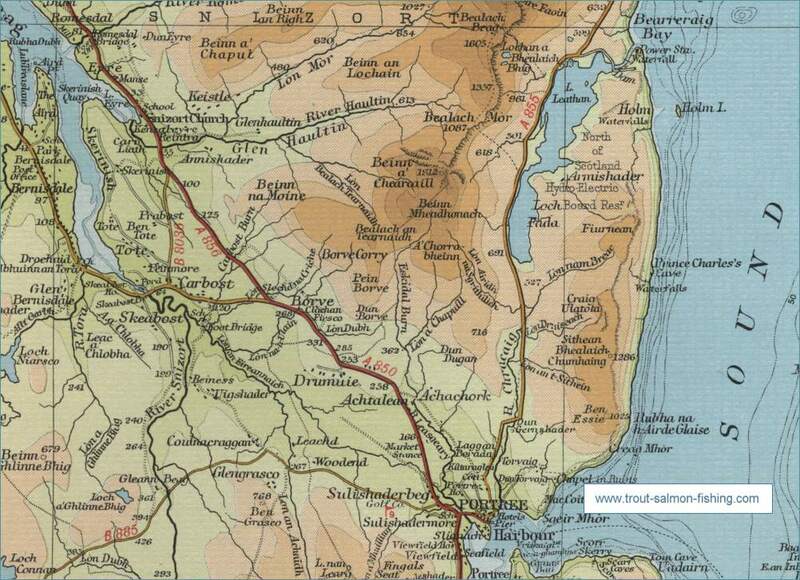 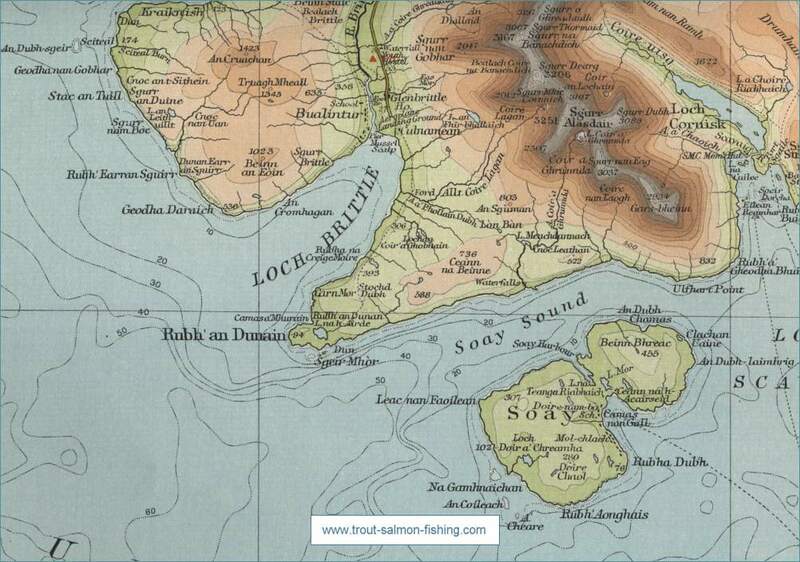 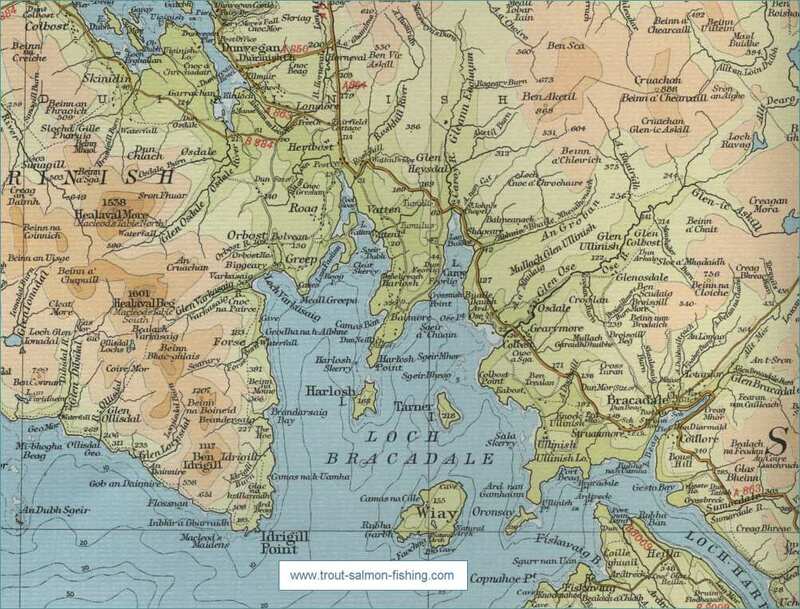 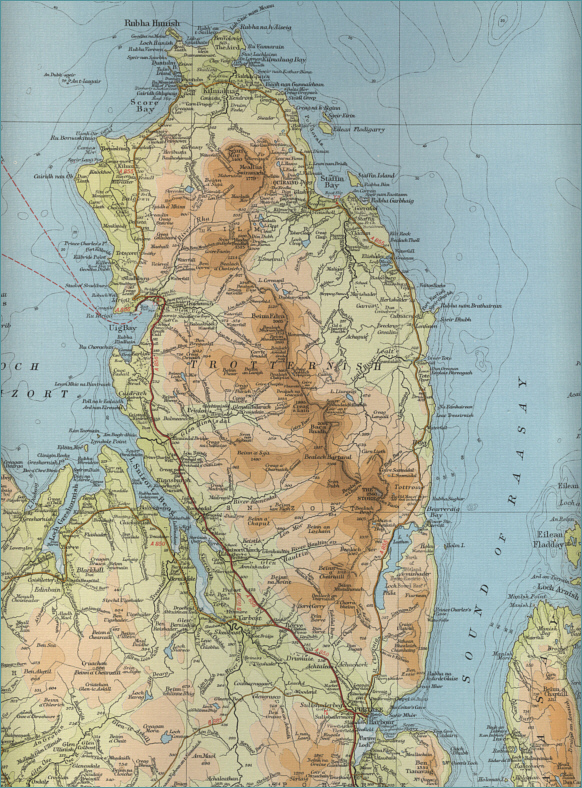 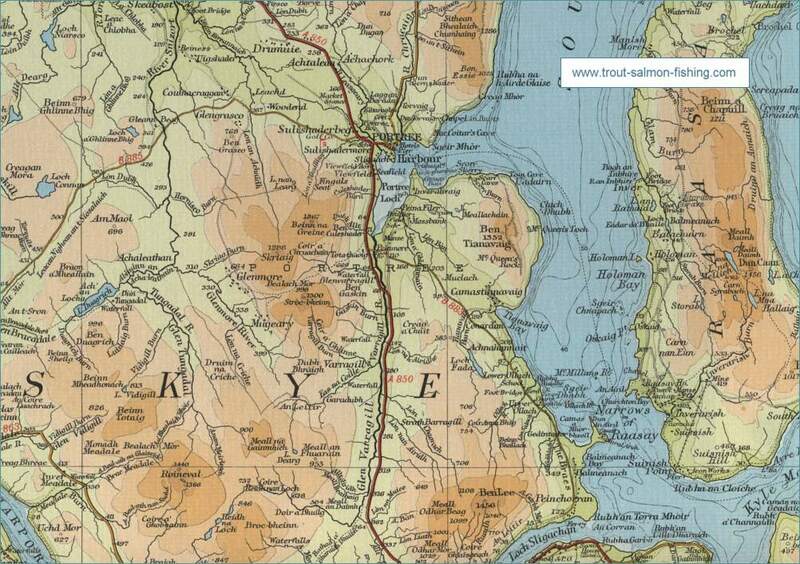 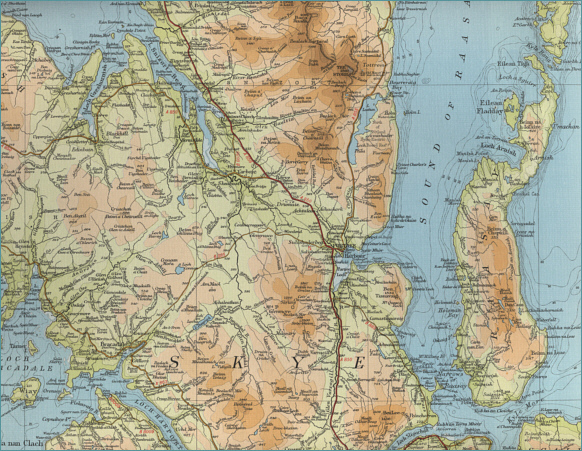 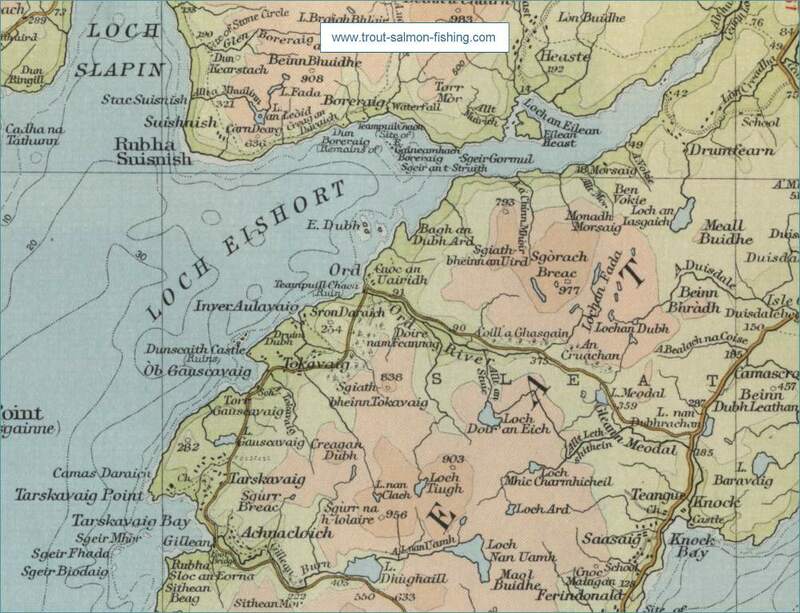 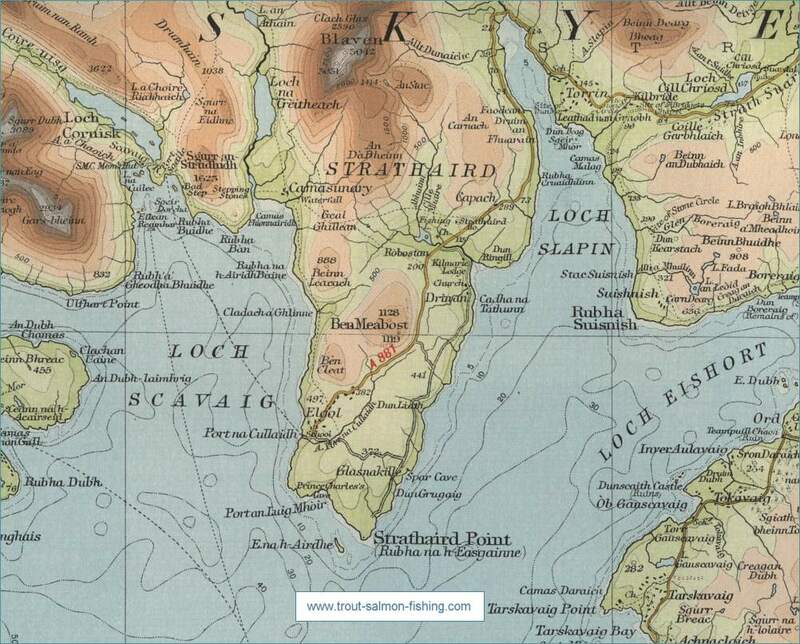 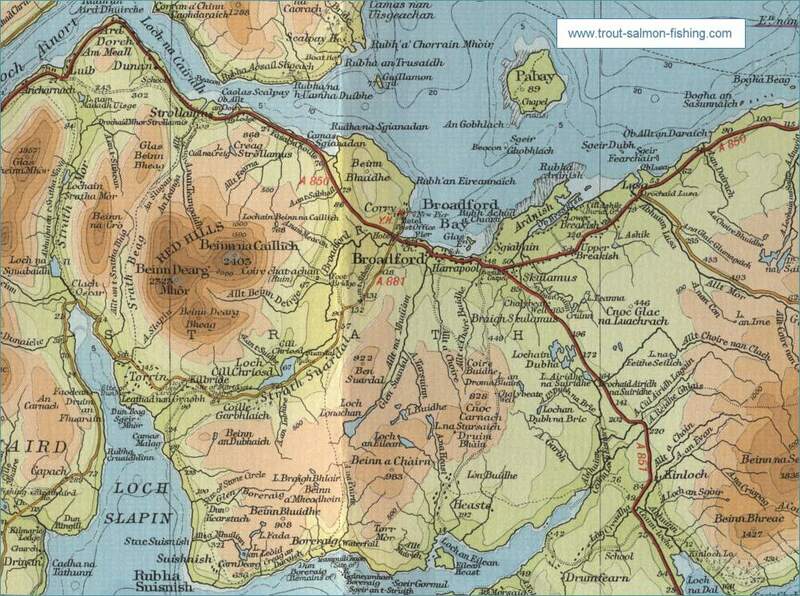 There are twelve beats on the river running to the sea loch estuary from the flats in the hills. 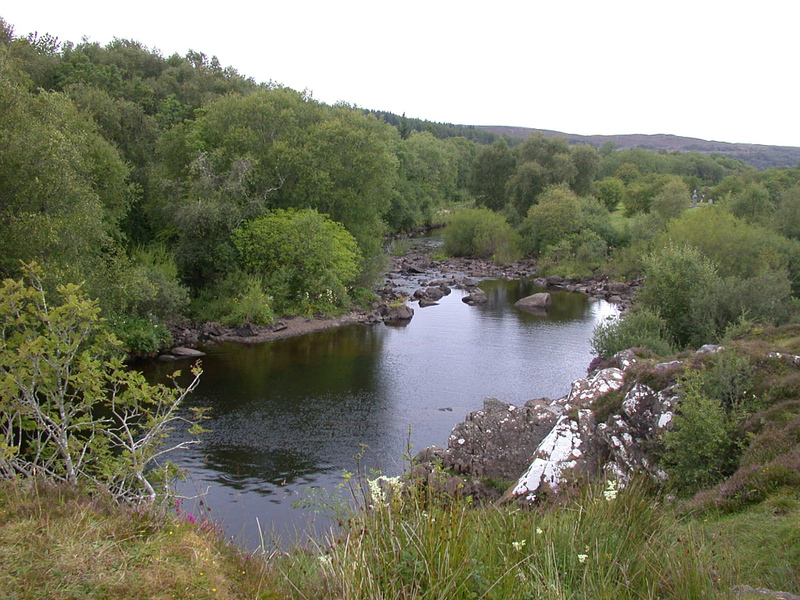 Wild trout abound throughout the river but it is their migratory cousins, the salmon and sea trout, which hold the greatest appeal for visiting anglers. 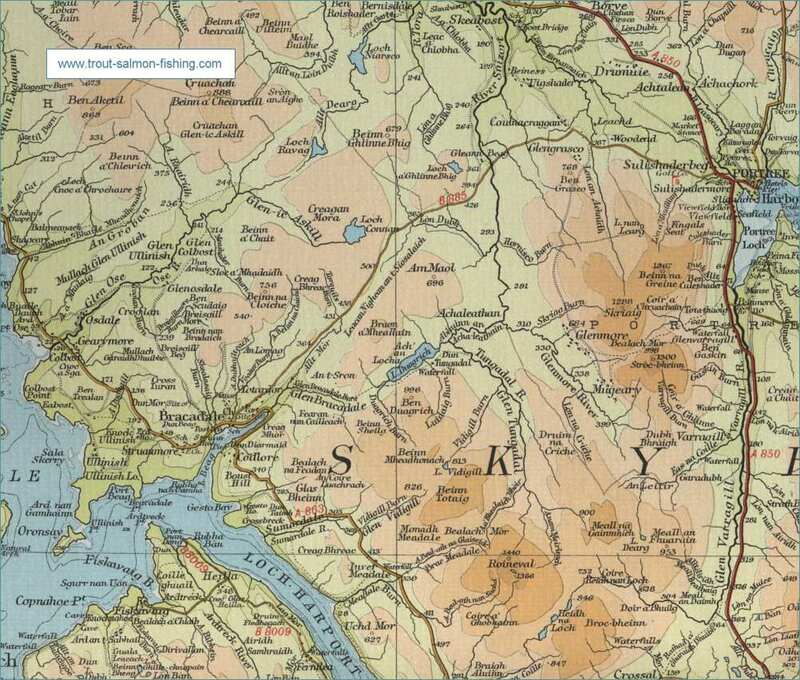 The main runs begin around the end of June or early July, depending on the flood tides, and continue to the end of the season on October 15th. 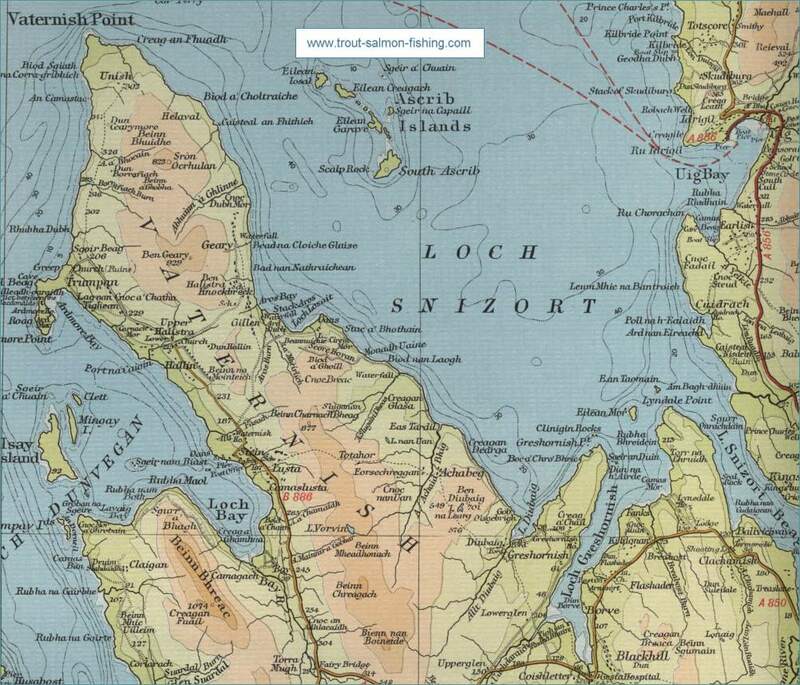 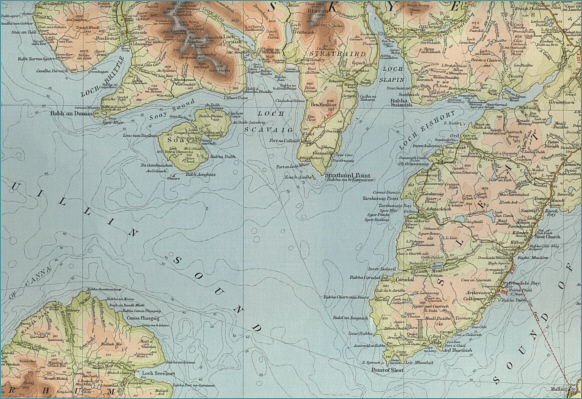 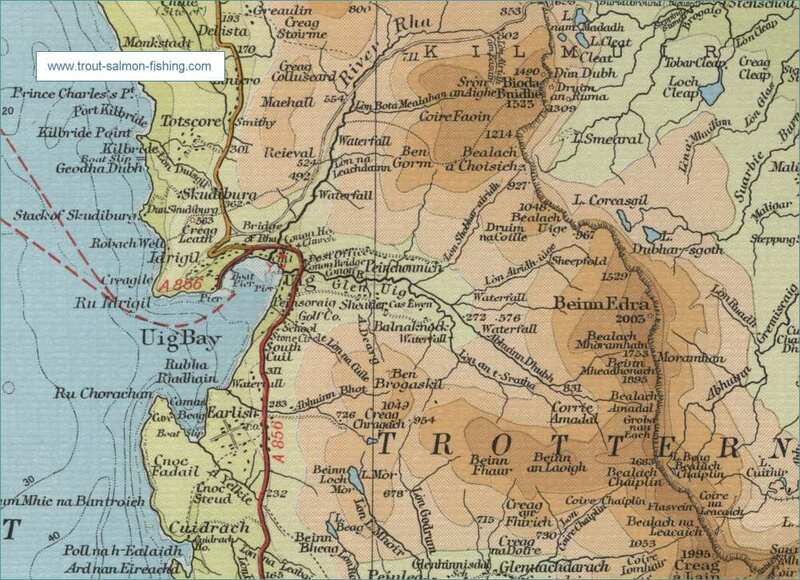 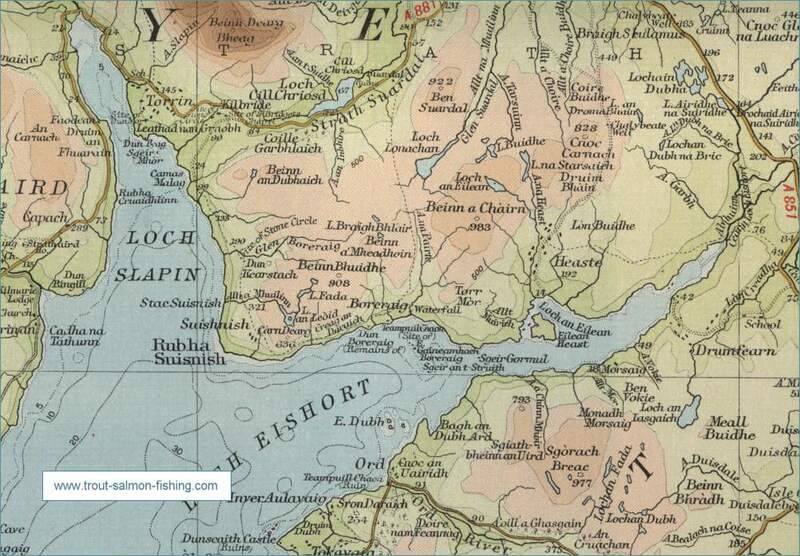 They find their way up the ten miles to the feeder loch (Loch Duagrich) at the head of the Snizort. 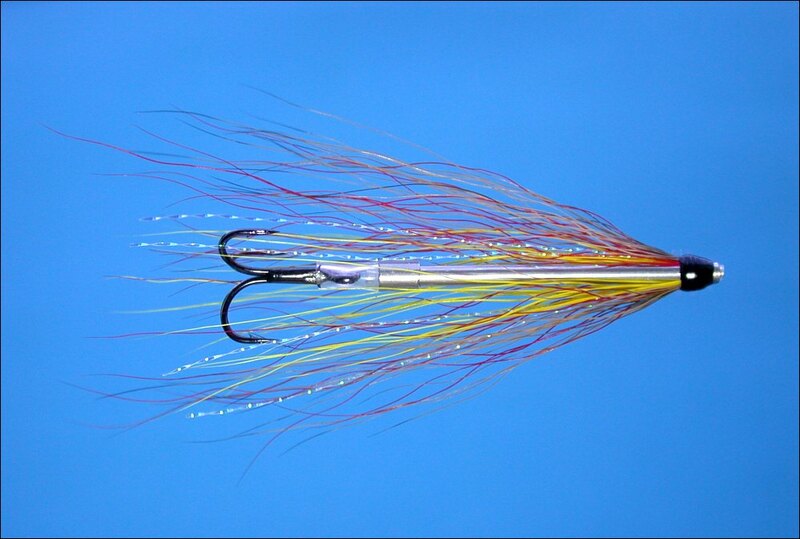 The best of the fishing follows rain combined with a high tide. 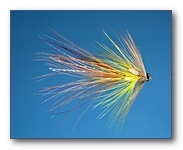 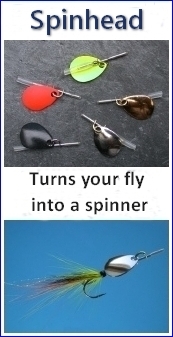 Method: fly only except in big spates when spinners are allowed, reverting to fly on the falling spate. 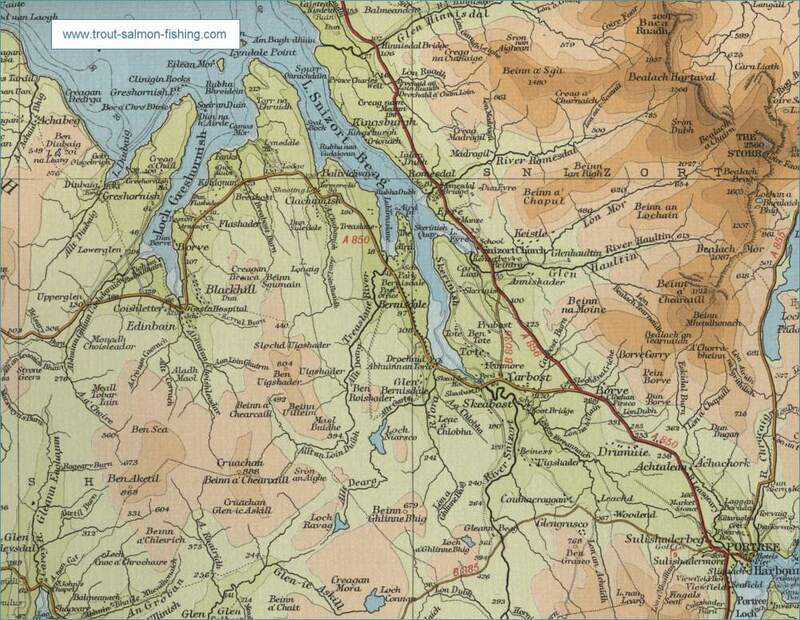 Beat Maps are available from the gillie's office. 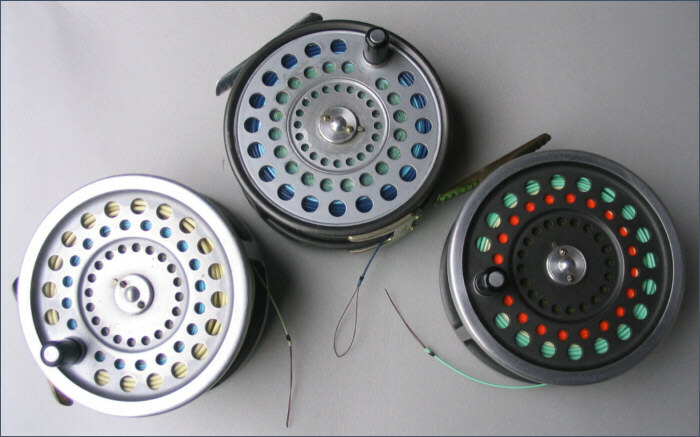 Permit Price: £35 per rod per day, £20 per half day, £180 per week (six days). 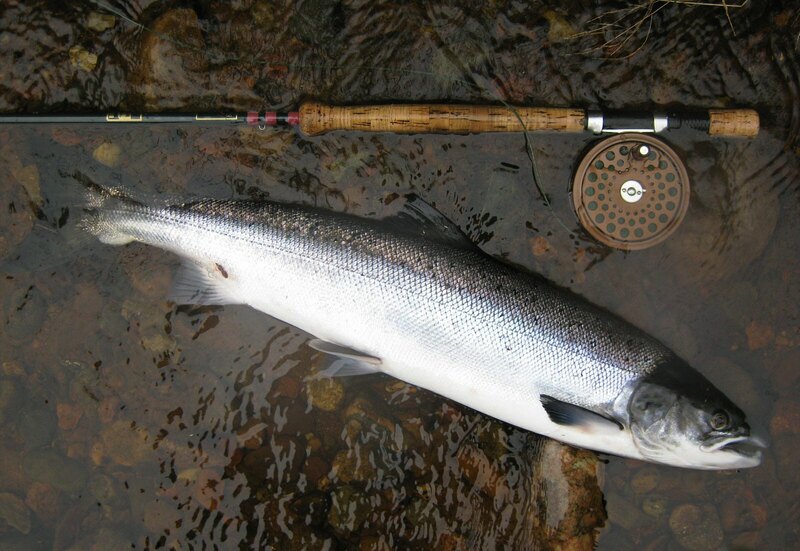 For more information contact Three Esses Ltd, The Hatchery, Skeabost Bridge. 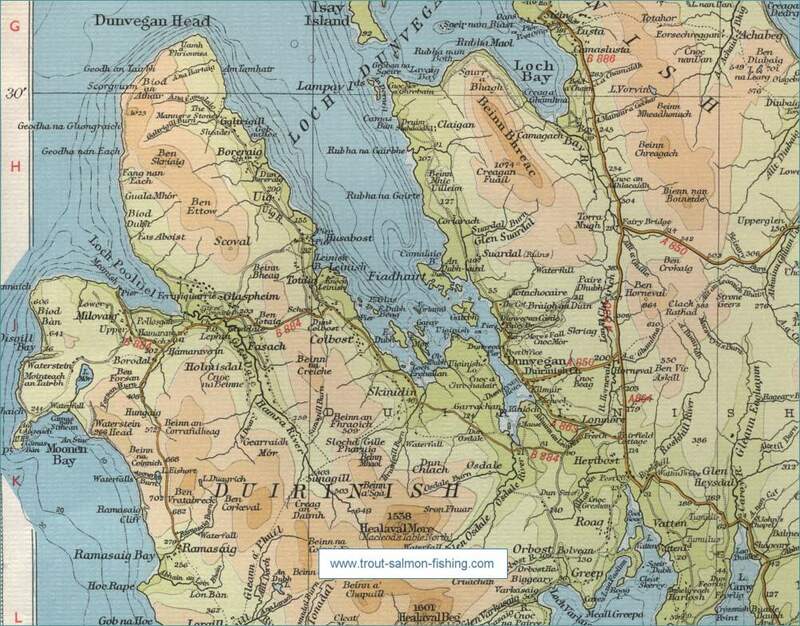 Tel 01470 532297 or reception at Skeabost Country House Hotel Tel 01470 532202. 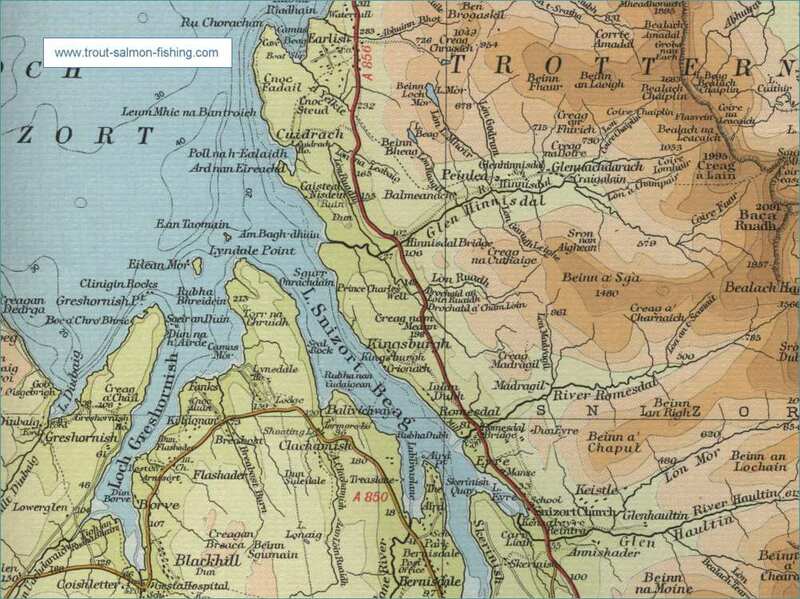 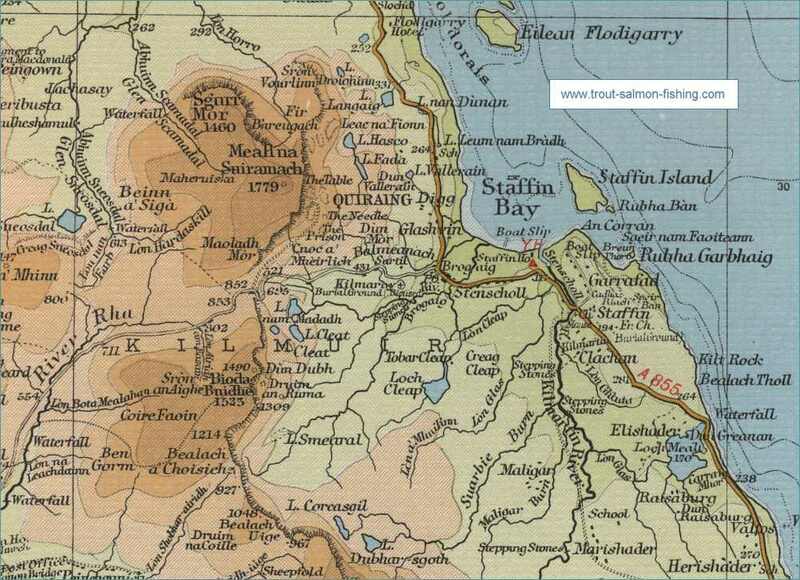 Portree Angling Association leases a stretch of fishing on the upper reaches of the Snizort. 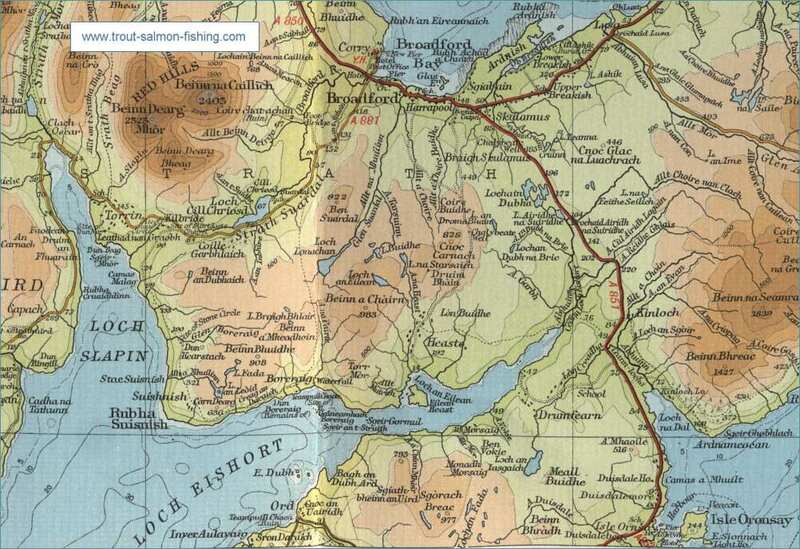 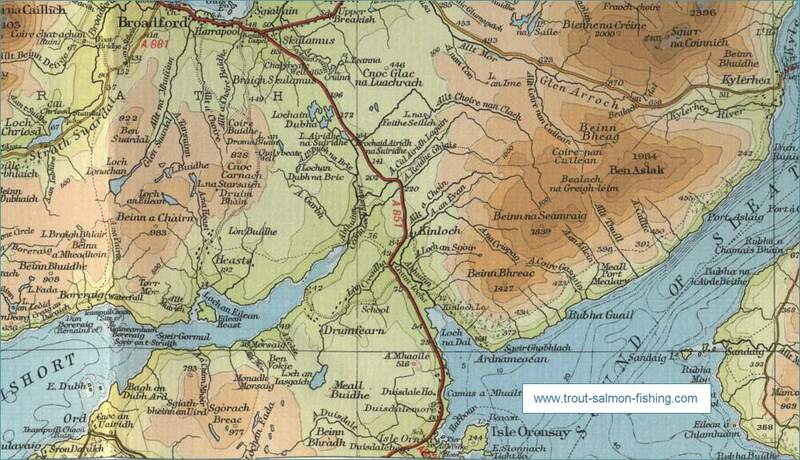 The Glenmore beat sees a very good run of salmon and sea trout, with fifteen salmon caught in 2009. 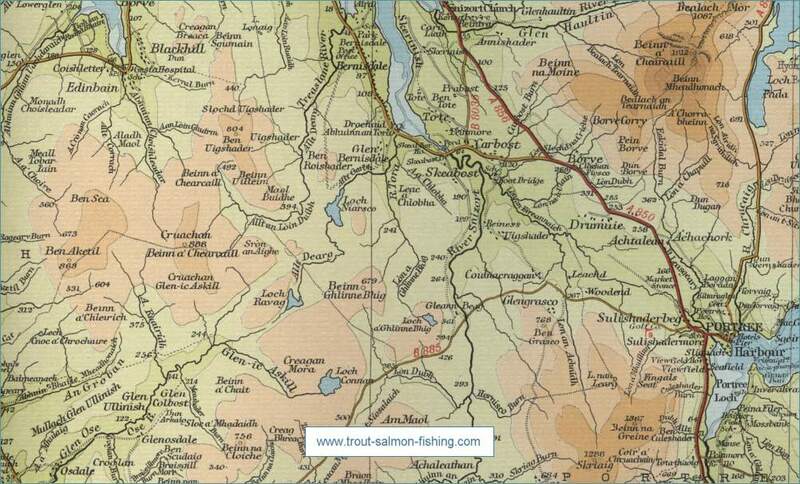 Also good brown trout fishing. 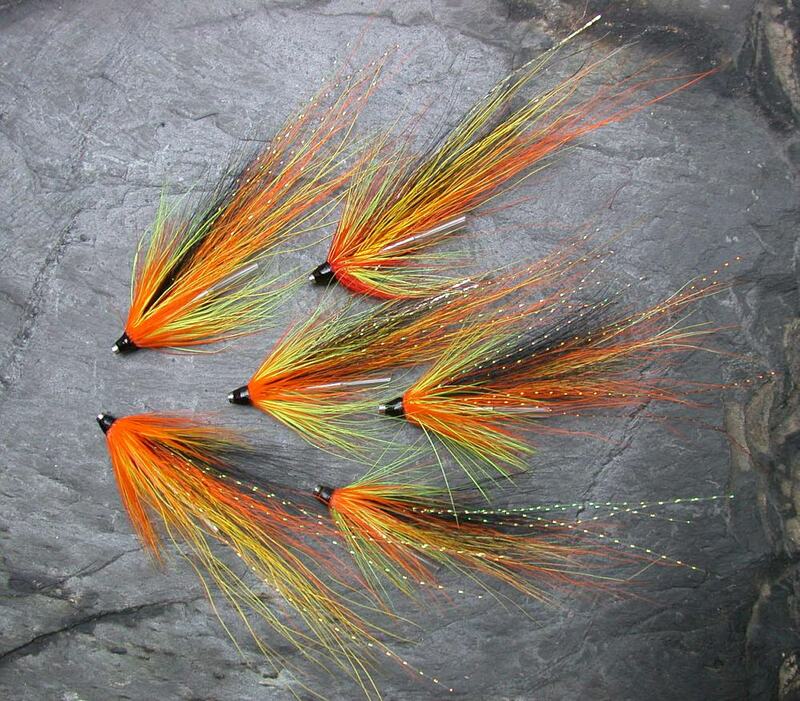 Salmon and sea trout possible. 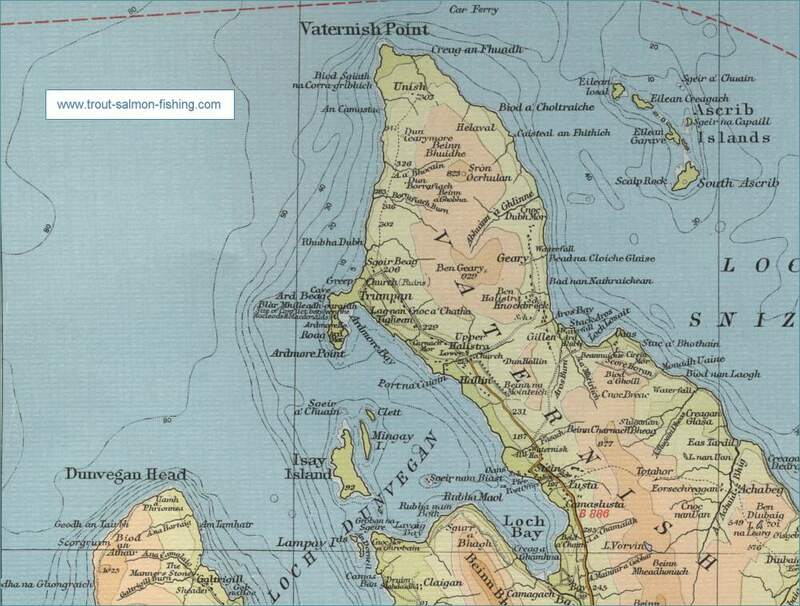 No permit required.